Then Elohim said, "Let us make man in our image, in our likeness, and let them rule"... Elohim blessed them and said to them, "Be fruitful and increase in number; fill the earth and subdue it. Rule over..."
That weird looking plant to the left is an "Ebony/Rose" tomato plant. It sits outside my townhouse in a planter that is supposed to have flowers like all the others. However, my neighbors were nice enough to let me do something different with it. In that pot, along with 2 tomato plants are chives and hot peppers. 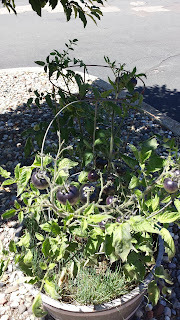 I had never seen an Ebony/rose tomato before. I saw some seedlings at my store and decided to give them a try. They start out green, slowly turn black, and then get a faint hint of red on the bottom. They are somewhere in size to a large cherry tomato or a small Roma. They have a nice, sweet flavor to them. I also have 2 "Illegal" gardens out back. Illegal in the sense that that area is a common yard for all owners. No one has complained yet. They attract butterflies and humming birds. I grew up in Sacramento, CA. The yards there are very small by Minnesota standards. My folks took our backyard and turned it into the Garden of Eden. They essentially put a giant "U" in the middle. Inside the "U" was the grass. Outside the "U" was the garden. We had a grapevine, a grapefruit bush (Yuk! 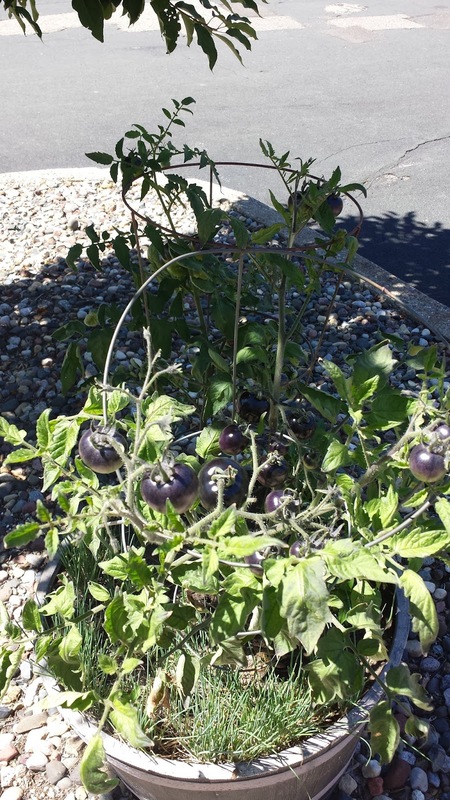 ), a lemon bush, a plum tree, two orange trees (One bloomed in the summer, the other in the winter), a strawberry bush, and tons of tomato plants. We don't get them here, but there was some kind of green worm/caterpillar that liked to eat tomato leafs in Cali. I thought they were nasty, little monsters as a little kid. My dad used to chase me around the backyard with them when he could find them. I'm certain it left irreparable damage to my psyche. When I was a kid, I didn't like those gardens. I hated weeding them. Too much work for a 10yr old. Now that I am older, I LOVE gardens. Come January, I start planting seeds in peat pucks and begin the process with my singular grow lamp. I built two gardens at my folk's place, both roughly 6x6. One contains a massive Raspberry bush. the other contains tomatoes, radishes, hot peppers and rhubarb. We also have planters elsewhere. Dad said that this year, we have over 30 tomato plants going. That's a lot of BLTs! Recently I finished "The Lost World of Genesis One." I burned through it in 2 days. I thought it was absolutely brilliant. 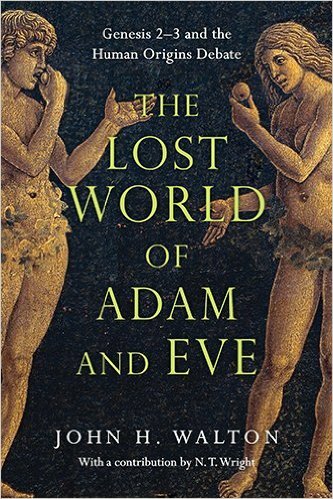 I am now half-way through "The Lost World of Adam and Eve." It's taking a bit longer, but is just as brilliant. The writer is Dr. John Walton, formerly of Moody, now at Wheaton College. He goes deep into the cultural context of these ancient stories and really works over the Hebrew words. It makes me regret that I lost the ability to read biblical Hebrew, because it is just so fascinating. There is soooooooo much going on in the Old Testament, and it is so easy for us "Moderns" to miss. church has and actually read scripture in it's cultural context, you can really plunge deep in to the Bible. If you allow yourself to look at it through the eyes of the ancients, it absolutely explodes with deep beauty. Needless to say, guys like Ken Ham hate him and calls him a false teacher. I can completely understand Ken's perspective, though. Nothing good can happen when you use actual scholarship. I mean, if you actually bother to respect the bible enough to read it in context, then you can't force it to say what you want. And if you can't force, cherry pick and twist scripture in to saying what you want, how will you get any money for Ark project??? Shame on mean, old John Walton and his expertise in ancient hebrew and biblical culture!!! "Bara"= to create, cause to function, etc. 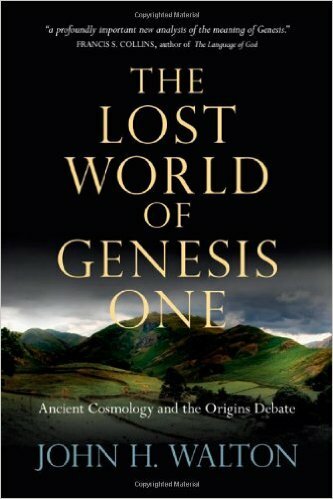 The main argument that Walton makes in his first book is that the story in Genesis 1 is NOT a story of material origins, but instead a story of functional origins. It's the story of God ordering a sacred place, a cosmic temple, for him to dwell in. Americans are very materialistic. So it's only natural for us to thing of creation in terms of making something. But that's not what was important to the ancient Hebrews. They viewed function as being the primary issue. If they held an object in their hand, they could obviously tell that it was a material object, but that wasn't what was relevant to them. "What's this thing supposed to do?" is what they would want to know. Purpose and function was of primacy. True Story: My last year of teaching, I had an advisory class once a week. In it, I had a 15/16yr old boy who desperately wanted to be "Cool." So one day, he comes into class wearing a Grill. I'm not talking about the thing you cook burgers on. This is a mouth insert...like a retainer. However, these will be encrusted with gold and jewelry. I guess it gives you street cred in lieu of actually being able to read at your grade level. I asked him if he could eat with it in? "No." Could you chew anything? "No." Could you kiss? "No." I noticed that he had to take it out so as to speak. So I asked him if there was really anything "Functional" that he could do with it? "No. It just looks cool." (I resisted the temptation to ask if he was certain about that.) I then asked him how much he paid for that grill. "$350." So anyhoooo, to the ancients what mattered was purpose and function. Think of it this way; you buy a house from the previous owner. OK, so the "House" exists...but it's NOT your "Home," yet. Your "home" does not yet exist. SO, you begin to move furniture into it. You assign various rooms with names that declare their purpose. "Billy's bedroom," "Den/Study," "Dinning room," Family room," "Secret gun closet behind hidden door to hide weapons in case of either Zombie apocalypse or to thwart the creeping socialism of the Federal government." You get the idea. It may have existed as a house, but it doesn't become your home until you assign the names and functions to it. What's the last thing you do? You move yourself into it to take up running the place. Ta da!!!!! Now you know what God did on the 7th day. By "Resting," he ceased giving functions to his cosmic temple and moved himself in to get on with running the show. Last post, I touched on what it means to be made in the "Image of God." I went pretty broad with it's implications. However, if I want to be specific and stay within the context of Genesis, then I have to stick with the immediate implications. Genesis 1 gives specific "Functions" to humans. I wont go deep into detail on the meanings of the words "Subdue" and "Rule over," but essentially ALL humans are called to be God's representatives/co-regents on this earth. That's our task. That's our function and purpose. You can see how the second creation story in Genesis 2 piggy-backs on that idea. The story says that God held off on making plants until he made a human to do stuff with them. "and there was no man to work the ground..."
What is it about human beings that we are all so deeply tied to the beauty of the created world? Why do so many people find it therapeutic to take a walk in the woods or a park, to plant flowers, to make things grow? I find it fascinating that many prisons use gardening as a form of rehabilitation for convicts. And even if a person isn't necessarily into plants, they still have a desire to create and be creative. For some people it's music, for others it's painting, writing, art, cooking, etc. For some people, their creative abilities might be working on cars, writing computer code, building houses. We have a desire to be creative, and I've seen more than enough examples of people popping bolts, or going bitter, when they don't find outlets for that desire/urge. Awhile back at work, we got a nice, new food processor. Our boss brought it in and set it on a work table. My friend Jordan looked at it and I actually watched his eyes get bigger. I thought I might need to get him a bib because I was concerned that he was going to start drooling. He is very serious about his his food skills. Why is it that humans are so hard-wired to have this desire? It's deep in our collective bones. Where does this desire come from? And odds are, as you've been reading this, you've been asking yourself about your own desires to be creative. :) I hope you find it, harness it and be what YHWH/Elohim calls you to be. I'm gonna go pick some tomatoes.